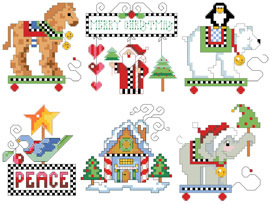 Fourth set of checkered ornaments featuring checkered borders or motifs. Pull-toys are the ornaments that are included in this set. collect all four sets for a wonderful gift for a loved one or decorate your tree with checkered ornaments. Contents: Stitch count is 35 wide by 35 high. When stitched in 14 count they will measure 2.5" by 2.5".